Epic of Gilgamesh ek epic poem prachin Mesopotamia se aais hae. George, Andrew R., trans. & edit. (1999, reprinted with corrections 2003). The Epic of Gilgamesh. Penguin Books. ISBN 0-14-044919-1. Kovacs, Maureen Gallery, transl. with intro. (1985,1989). The Epic of Gilgamesh. Stanford University Press: Stanford, California. ISBN 0-8047-1711-7. Glossary, Appendices, Appendix (Chapter XII=Tablet XII). A line-by-line translation (Chapters I-XI). Mason, Herbert (1970). Gilgamesh: A Verse Narrative. Boston: Mariner Books. ISBN 978-0-618-27564-9. Sandars, N. K. (2006). The Epic of Gilgamesh (Penguin Epics). ISBN 0-14-102628-6 - re-print of the Penguin Classic translation (in prose) by N. K. Sandars 1960 (ISBN 0-14-044100-X) without the introduction. Parpola, Simo, with Mikko Luuko, and Kalle Fabritius (1997). 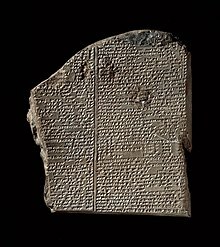 The Standard Babylonian, Epic of Gilgamesh. The Neo-Assyrian Text Corpus Project. ISBN 951-45-7760-4 (Volume 1) in the original Akkadian cuneiform and transliteration; commentary and glossary are in English. Ferry, David (1993). Gilgamesh: A New Rendering in English Verse. New York: Farrar, Straus and Giroux. ISBN 0374523835. Translations for several legends of Gilgamesh in the Sumerian language can be found in Black, J.A., Cunningham, G., Fluckiger-Hawker, E, Robson, E., and Zólyomi, G., The Electronic Text Corpus of Sumerian Literature (http://www-etcsl.orient.ox.ac.uk/), Oxford 1998-. Wikimedia Commons has media related to Category:Gilgamesh. Ii panna ke 11 March 2013, ke 10:43 baje, pichhla time badla gais rahaa.